1 joint of either shoulder or leg of lamb. Rub the meat all over with the garlic and salt and pepper. Place in a roasting tin, putting the remains of the garlic underneath. Roast on the middle shelf of a medium pre-heated oven – Gas Mark 5 (375°F/190°C) for about 1 hour, depending on the size of the joint. It should be pink but not raw at the centre, a little less than you’d normally want to eat it as it will be re-heated in the sauce. Remove the the oven and pour off the fat. Remove the garlic. Whilst it ‘s “sitting”, boil the broad beans in some salted water until they are just tender. Drain, but do not throw away the water. Carve the meat into thick slices, preserving all the juices. Set it aside. Put the roasting pan with the meat juices onto a very low heat, add the lamb or chicken stock and the egg yolks beaten up with the cream. Stir constantly until the sauce thickens but do no allow it to boil. 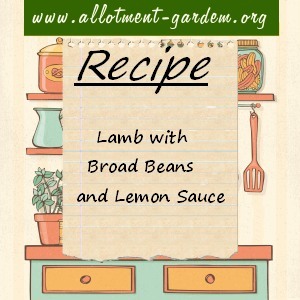 Gradually add the lemon juice and as much of the bean water as the sauce will take without becoming too thin. Check for seasoning. Return the meat to the pan and allow it to heat through, being careful not to allow it to boil. Add the beans and allow to warm back through. Serve immediately. A main course meal on its own that serves at least 4.